Erich Segal’s study of Western comic drama manages to seem both broad and narrow. 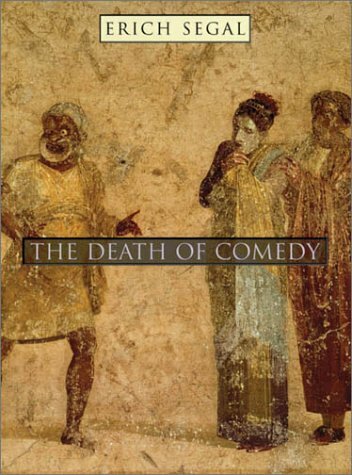 Broad in that it investigates the origins of the word “comedy” itself as well as the origin of the form in ancient Greek fertility rituals and traces its development from Aristophanes into the 20th century. Narrow in that, by sticking to a traditional notion of comedy as dramatizing the triumph of instinct over intellect and as almost always concluding in a celebration and/or a wedding (kōmos and gamos, in Greek), Segal is ill equipped to deal even with Shaw, to say nothing of Jarry, Cocteau, and Beckett, all of whom he counts as “assassins” of comedy. What’s more, as one scholarly reviewer complained, Segal remains mostly fixed in viewpoints drawn from Freud, Henri Bergson, and Northrop Frye. These are often profound, but other, newer approaches probably exist. (The linked review recommends Comedy: An Introduction to Comedy in Literature, Drama, and Cinema. )Nonetheless, Segal's study has many values. Segal gives detailed discussions—recaps in the best sense of the word—of more than two dozen plays, by Aristophanes, Euripides, Menander, Plautus, Terence, Machiavelli, Marlowe, Shakespeare, Molière, Jonson, Wycherley, and Beckett, and he attends to a host of supporting works as well. I happen to have seen plays by Beaumarchais, Ben Jonson, and Alfred Jarry onstage and to have watched a film version of Machiavelli’s Mandragola, but I’ve never even read most of the Greek and Roman works that Segal surveys, nor some of the modern ones either. Spending scores of pages in the company of Aristophanes and his Old Comedy colleagues, whom Segal describes as “great artists whose theatrical forte happened to be a kind of episodic vaudeville,” made me long for a real time machine, although Segal’s text does a pretty good job of simulating one.Even his tangential remarks can be striking, as when he quotes Malvolio’s parting words, “I’ll be reveng’d on the whole pack of you,” and then observes that the uptight character essentially had his way scarcely a generation later, when the Puritans closed the English theaters. Similarly, his judgment that Jonson was “as much a moralist as a dramatist” suggests one possible reason for Jonson’s lack of favor since the Restoration period. Even Segal’s exposition of how the modernists “exploded” traditional comedy serves a purpose—it reminds us how radical that movement has been. And his translations, as well as his own text, are vivid and colorful.